Shoulder injury prevention is paramount for every swimming and as the Olympics close (note: this article was written in the summer of 2012), many excited viewers will start swimming programs. Unfortunately, many hit the pool like a steam engine without a designed plan. Once again, failing to prepare is preparing for failure. Shoulder injuries run rampant through the sport of swimming and only increase with age and training volume. Therefore, having a proper shoulder injury prevention program is essential for swimming continuance and enjoyment. Stocker 1996 suggested fatigue is the first factor precipitating shoulder injury. Therefore, the first mandate for healthy shoulders is a progressive swimming program. Make sure to progressively increase your swimming volume, allowing the shoulder ample time for recovery. Even though swimming volume is the main contributor to fatigue, it is not the sole contributor. First, let’s discuss a misconception that surrounds the shoulder. 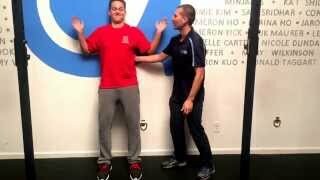 The main fallacies in many shoulder prevention programs are the use of stretching and mobility. Shoulder range of motion is necessary for achieving an early vertical catch, but a fine line is present between necessary and excessive mobility. Excessive mobility is one risk factor for shoulder injury (Kenal 1996). Luckily, if you swam as a child, it is likely you have the necessary range of motion to do a proper early vertical forearm. If you did not start swimming until after puberty, self soft tissue techniques and contract-relax stretching are effective means for improving shoulder range of motion, with minimal risks. These forms of mobility are more effective and safe, as they do not promote instability. From my experience, there are three main areas to provide adequate shoulder injury prevention: length, strength, and timing. Excess shoulder range of motion increases the risk of injury, but muscle knots and poor tissue quality lead to compensations and aberrant movement patterns increasing one’s risk of injury. Luckily, simple self soft tissue mobilizations are able to improve this poor tissue quality, restoring your body after grueling workouts, and preparing your shoulder for the demands of swimming. Overhead movements stress and strain the rotator cuff muscles, therefore providing them the strength to stabilize and prevent excessive humeral (upper arm) movement is important to keep the surrounding tissues healthy. Strength of the shoulder blade stabilizers allows the body to safely exploit length. If your shoulder blades are not stable, then the body is attempting to move on an unstable surface and the risk of stress increases. Turning on and off muscles at the proper times is essential for swimming success and injury prevention. Often, an athlete has enough strength and length to prevent injuries, but the body does not know how to coordinate these attributes to strive off injury. Therefore, it is essential to teach the body how to differentiate the neck, shoulder, thoracic spine, low spine, and shoulder blade muscles. This coordination helps the body work as a unit, not parts. The methods to improve length, strength, and timing are immense, yet essential. Too often swimmers do excessive yardage without proper preventative tools. This results in the most impairing form of training, discontinuance from the pool. Ensure you’re doing a well-rounded shoulder injury prevention program focusing on length, strength, and timing and performing a progressive swim program with correct technique. All of these areas will keep you healthy, and enjoying swimming. Stocker, D., Pink, M., & Jobe, F. W. (1996). Comparison of shoulder injury in collegiate and masters level swimmers. In J. P. Troup, A. P. Hollander, D. Strasse, S. W. Trappe, J. M. Cappaert, & T. A. Trappe (Eds. ), Biomechanics and medicine in swimming VII (pp. 90-95). London: E & FN Spon. Kenal, K. A., & Knapp, L. D. (1996). Rehabilitation of injuries in competitive swimmers. Sports Medicine, 22, 337-347. His dedication to research and individualization spurred him to open COR in 2011. Since 2011, Dr. John has been featured in Gizmodo, Motherboard, Stack Magazine, and much more. He is also the creator of Swimming Science, Swimmer's Shoulder System, and Dryland for Swimmers.